TYPES: Herbaceous perennial with edible flowers, leaves and cloves. Garlic (Allium sativum) is divided into two subspecies: var. ophioscorodon and var. sativum. Ophioscorodon garlic is called “top-setting,” “ophio” or “hardneck” garlic; the family includes Rocambole, Continental and Asiatic types. Leaves grow from a hard, central stalk and then an edible scape (flower head) forms, with tiny buds called “bulbils.” Most hardneck varieties form four to eight cloves around the central stalk’s base. Their flavor tends to be pungent with some subtlety. Sativum varieties called “softneck” or “artichoke” garlic, have heads that tend to be large, with 12 to 20 small cloves and no central stalk. Leaves sprout directly from each clove, are flexible and are best for braiding. Softneck garlic can be either pungent or mild, but lacks subtlety. A third category exists that is neither. It has large, long scapes and large round flower heads that sometimes form small black seeds. The flower heads are beautiful and make great cut flower arrangements. The bulbs and the cloves are huge and the flavor is excellent. This garlic is probably the result of natural cross breeding. HABIT: Height: 12 inches - 4 feet, some even taller. Spread: 12-24 inches. Full sun to partial shade. Considerable variance in the various subspecies. Some have flower heads and some don’t. CULTURE: Easy to grow in healthy soil from cloves, rounds or bulblets. Good drainage is essential so raised beds, rows or hills are best. Fertilize at least twice per season with an organic fertilizer and spray at least monthly with Garrett Juice. Fall is best, but can be planted in the spring. In Dallas, I plant between October 1 - October 15. For larger bulbs, cut the flower stalk off as soon as it starts to emerge. The second method is to let the flower grow up and to cut it off before opening. Hang upside down to dry and use as dry arrangement material. The third method is to allow the seed heads to mature and open. Garlic thrives on even, not-too-heavy moisture and prefers cool roots, so irrigate as needed and mulch deeply with straw, shredded leaves or shredded native tree trimmings. Mulch will also protect against frost in cold areas and help control weeds anywhere. In spring, foliar-feed with Garrett Juice every two weeks until scapes appear and side-dress with alfalfa meal four to five weeks into the season. Use 2 lbs. per 100 sq. ft. Healthy foliage in early Spring. PLANTING: Plant about a month before the coolest time of the year. In Dallas our perfect time for planting is October but I’ve had excellent production planting in the middle of winter. If you plant early, roots will form quicker into warmer soil and nutrients are more available to help to form more cloves. Garlic planted later will normally grow to be the same size plants, but will have fewer, larger cloves. Fall is the best time to plant any garlic. Plant individual garlic cloves – pointy end up for best results. Each clove will form a new bulb by the next growing season. Garlic thrives on spring and summer sun and cool nights but it needs heat to form bulbs. Plant in prepared beds with the usual amendments - compost, rock minerals like lava sand and Azomite and microbe stimulators (sugars like cornmeal and molasses). Garlic is strange in the fact that is has disease fighting powers while at the same time can be susceptible to several disease pathogens. The bed preparation mentioned above, especially the cornmeal, greatly helps prevent these issues. Using (hopefully, organically grown) large bulbs, separate into individual cloves and plant them in prepared soil, 1” deep in clay soil, 2” deep in sandy soil. Point up is the best but, I’m usually going too fast and lay the cloves on their sides. Soaking the cloves in Garrett Juice before planting is helpful. Putting cornmeal in the soil at planting also helps, especially if your garden soil is not alive and healthy yet. Space the cloves about 4 - 10 inches apart. Water the cloves in and then cover with about 1 1/2 inches compost. Seed emergence: 7-14 days. Garlic sprouts will emerge within a few weeks and the plants will continue to grow into the winter, especially in the southern states. A little browning of the leaf tips is normal. On nights of hard freeze, you can cover the planting with floating row cover. Increase the thickness of the mulch as the plants grow to maintain perfect soil conditions. HARVEST: Time varies, but should be done as the leaves start to turn brown. It’s bad advice to wait until the tops turn brown and fall over. At that point the bulbs will be over-mature and often split open like a flower. At this point, food value will begin to diminish. Garlic can’t be stored in the ground as onions can. Watering too long or too wet soil will cause bulbs to rot. Days to harvest range from 90 to 180. For harvest, wait until the plant’s bottom leaves have started yellowing. As the leaves die, layers of the papery “wrapper” around the bulbs will begin to decay, so harvest before you lose too many. This is different than onions that can be left in the ground after the tops have completely died. Loosen soil around the bulbs with a turning fork, pull the bulbs from the ground and shake off the soil. Garlic bruises easily, so avoid banging the heads. The crop is also vulnerable to sunscald, so move the heads to a shady spot. Trim the tops and roots, and arrange the bulbs on racks to dry and cure. Or, leave the plants intact and hang in small bunches. After garlic is fully dry (in about three weeks), remove all remaining roots and gently brush off any lingering soil. Store garlic in mesh bags or other breathable containers in a cool, dry, dark place. Storage longevity variety but will range from 6 to 12 months. To save planting stock for next season, choose large, firm bulbs that have the variety’s best characteristics. Set aside the plumpest, largest cloves. Avoid double and sliver-like cloves. Garlic being harvested a little too late. STORAGE: Garlic should be cured slowly indoors, in low humidity, not in windrows in the garden. Dig the bulbs when the leaves begin to turn brown in the summer and store in a cool, dry place. In order to avoid diseases, bruising and other causes of spoilage, the bulb wrappers should cover the cloves. A good rule of thumb is to harvest the bulbs when the top has at least 5 leaves. Each leaf represents a bulb wrapper. Each brown leaf means a dead or decaying bulb wrapper. When wrappers are damaged or gone, the garlic cloves are not necessarily ruined, but they are possibly injured and in danger of spoilage. Do now wash the bulbs, and do not trim off the roots and tops unless space is a problem. TROUBLES AND SOLUTIONS: Few problems, if any, when planted in healthy soil and at the right time of the year. Snails occasionally attack but can be controlled with garlic pepper tea or the commercial product Sluggo. CULINARY USES: Garlic leaves and cloves are great for eating and for seasoning various foods including vegetables, meats, sauces, gravies, soups and just about anything else. Try the young leaves in scrambled eggs and try garlic powder on most any meat dish. Fresh garlic is even better. If you are worried about garlic breath, chew on a few fresh leaves of parsley or sweet basil. The high chlorophyll content of these herbs will neutralize the garlic smell. Of course, if everyone eats garlic, no one will notice the smell. MEDICINAL USES: Garlic is taken for the prevention and treatment of colds and bronchitis. It is said to help also treat lead poisoning, help normalize blood pressure, kill bacteria, detoxify blood, and is a natural antibiotic. Garlic is said to increase endurance and to be useful in easing the pain of earaches, removing skin blemishes, and of course – warding off vampires of course! LANDSCAPE USES: I think garlic is a beautiful plant and useful in the landscape garden, herb garden and vegetable garden. Garlic is a beautiful ornamental plant or for use in mass plantings or interspersed in the perennial or rose garden. Using garlic as an ornamental plant is often overlooked. I plant garlic in the perennial beds, the herb garden and even in pots because I like the way it looks. The foliage is dark green and the flowers are dramatic. Just don’t let the flower heads mature and scatter or you will have garlic everywhere! Garlic planted along the edge of the mulch walkway. GENERAL INSECT CONTROL: Interplant garlic with ornamental landscape plants as well as food crops to ward off various pests. Tomatoes seldom have spider mite problems when garlic is planted nearby. On the other hand, garlic is reported to slow the growth of beans and peas. Garlic tea sprayed on plant foliage before heavy insect infestations works as a powerful repellent to most problem insects and many diseases. Gardeners use garlic tea by pouring it on fire ant mounds and claim excellent results. When hot pepper oil is added to the garlic, it becomes a mild but effective broad-spectrum pest repellent. . For mosquito control - pour or spray garlic oil into standing water, stagnant ponds and other wet breeding spots. It will control mosquito larvae quite well. Spraying the air with garlic tea works as well as the toxic chemicals to get rid of flying adults. Mosquitoes can also be repelled for approximately 20 days by broadcasting dry granulated garlic at about 1 lb. per 1000 square feet. 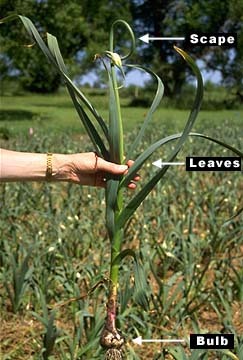 FUNGICIDAL CONTROL: Garlic has significant fungicidal powers. It will aid significantly in the control of anthracnose, powdery mildew, downy mildew, rust, tomato blight, brown rot on stone fruit and other disease problems. Even the scientists like Charles L. Wilson with the US Department of Agriculture report that members of the garlic and pepper families have effective fungicidal components. INSIGHT: Garlic is one of the world’s most health giving foods, an important medicinal herb, a key ingredient in homemade insect spray and a good looking landscape plant. Garlic should be a staple of every garden. Cloves are great for seasoning all kinds of foods or for roasting and eating whole. Young garlic greens are prized by cooks and chefs for use as a chive-like garnish for numerous dishes, including garlic pesto. Besides tasting good there is scientific evidence confirming the health benefits of garlic. NOTES: Giant garlic, also called elephant garlic, Allium scorodoprasum, has milder flavor than true garlic and produces a fist size bulb. It is actually a leek, but its culture is the same. Garlic can grow botulisms when stored in oil too long. It is best to use garlic oil soon after making. Garlic can be too “hot” for those with gastrointestinal problems. Giant garlic or elephant garlic is actually a leek and has a milder flavor than true garlic. Chew fresh leaves of parsley or sweet basil to cure "garlic breath." The high chlorophyll content helps to neutralize the garlic odor. Garlic tea is an excellent insect control.